Skippering a yacht for the first time can be a daunting yet exhilarating experience. The RYA Day Skipper practical course is designed for you to learn to sail and "Take Charge" of a sailing yacht safely and confidently. You will obtain the RYA Day Skipper certificate, and be able to charter a yacht pretty much anywhere in the world. During the course you will be taught to deal with all the responsibilities a Skipper has to deal with. These include weather forecasting, provisioning, engine maintenance. But also sail selection and handling, passage planning, watch keeping, navigation and pilotage. There is particular emphasis on boat handling under sail and under engine. During the course you will practice mooring and anchoring under various conditions. Your experienced and patient instructor will teach you these skills and you will put them into practice as you skipper the yacht. 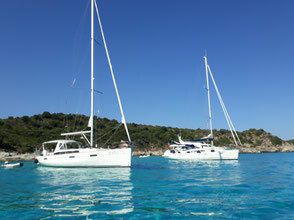 You will prepare and sail short passages among the beautiful Croatian Islands. You will live aboard for the duration of the course and spend the nights at anchor in beautiful bays or in modern marinas. You will visit many different harbours and anchorages and practice various pilotage techniques which are an essential skill for the aspiring skipper. You will also complete at least 4 night hours sailing to practice night navigation, without the use of electronic navigational aids. With a maximum of 5 students per yacht, your instructors can devote plenty of time to your needs and focus the program to the areas you need most. At the end of the course you will be confident to skipper a cruising yacht on short passages by day. Students who successfully complete the Day Skipper course are awarded the RYA Day Skipper practical course completion certificate. With this worldwide recognised certificate you can charter a yacht pretty much everywhere in the world. Please select course dates here below !! - Taking and plotting visual ﬁxes. – Using secondary means for position fixing. - knows about toolkits, spares and lubricants, location of filters and bleed points for fuel, tension of drive belts and how to adjust or replace them. - Has experienced sail cruising at night, including leaving and entering harbour. - Understands the special consideration for pilotage plans, keeping a lookout and identifying marks by night.